Wow!! I spent the entire day (6 hours) at retail stores looking for HDMI cables and couldn't find any "quality" cables under $100!! So decided to look on Google and found this site called "Cable Chick". Sounded too good to be true until I started reading all the feedback from existing customers. I found heaps of HDMI cables and specs on each of them, which you don't find in the retail stores. So decided to give it a go and made a purchased, within an hour I received confirmation of dispatch. Again I thought it was too good to be true... but the very next day I received the cable in my post box. Plugged it in that night and the quality was amazing!!! Thanks, I have forwarded your website to a number of friends and will be back buying again soon. 2m Firewire 1394 Cable 4P to 4P (i.Link) + FREE SHIPPING! The perfect complement to your FireWire camcorder. We've all received a few compliments, but can you remember the best one you have received? Were you told your hair looked great? Did someone admire that crazy-awesome t-shirt you found on holiday? Whatever it was, it made you feel like a million bucks, and that's the kind of service you can expect from this amazing 2m FireWire 1394 4P to 4P (iLink) Cable (AKA: DV Cable). This is just the ticket for working between high-end FireWire enabled camcorder devices, DVD players, amplifiers and both Windows and Apple computers. You'll be looking at and hearing blazing-fast 400Mbps video and audio thanks to nickel silver connectors, and you'll be praising the advanced twisted-pair cable design for its error-free data transmissions; regardless of whether they're your high-resolution home movies or your important digital files. FireWire / iLink camcorder cables don't come any better than this. So if you need a DV Cable that's been manufactured to IEEE 1394a spec, is compatible with Mac and PC and will work with all FireWire and iLink capable camcorders, you need look no further! If it's got FireWire, this cable has got you covered. This product is fully compatible with both Microsoft Windows and Apple Macintosh computers. I recently went looking for a 4 pin to 4 pin Firewire cable. I have a Sony FX1-E Camera, Ive been using a 4 pin to 6 pin to connect to my Computer. Ive recently acquired a new Laptop that has the capability of handling everything my video could through at it, but it needed a 4 pin to 4 pin Firewire. I went to the Sony site, where they had a Cable on offer for quite an enormous price, but then went on to say it was currently out of stock, so I thought i didnt want to wait so let my fingers do some Googling. There was a plethora of sites, but somehow the wording of what you were saying captured my attention. I was greatly impressed with your pricing and particularly your discounts which I thought will more than cover P&P so went ahead with the purchase. I was also impressed with the fact that I placed the order Friday Afternoon, and it was in my mailbox Monday morning. Complete with a couple of Minties and a discount offer for a future transaction. As my mate Andrew Lock would say, 'Everything is Marketing and marketing is everything'. Ive got to say Im a very happy and satisfied customer. Answer: "These Firewire cables are not branded and have been developed to our requirements. They are a very high quality cable with gold connectors and extra shielding. We are so confident in the quality of these cables we back them with a high 5 Year Warranty! 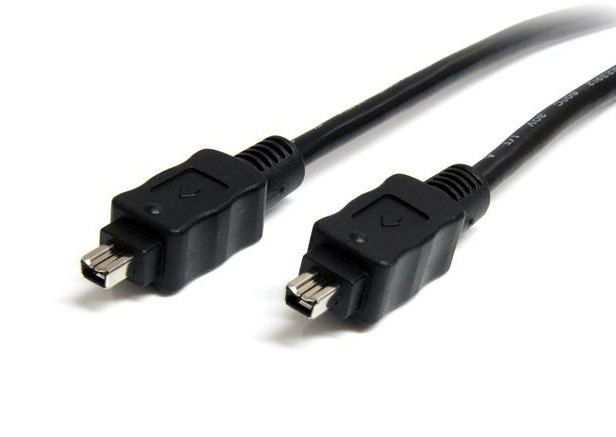 I personally use one of these Firewire cables to connect our Canon HV20 Full 1080p HD Camcorder to our PC for video transfer and editing." Answer: "Yes the Sony V1P has 4P Firewire." The 2m Firewire 1394 Cable 4P to 4P (i.Link) I purchased for transfer of old Sony TRV27E camcorder DV tapes to same vintage XP Dell laptop worked perfectly. Indeed, Firewire DV transfer was required, since attempting the same transfer using USB cable was very poor video quality. Thanks for having the cable I needed.